For more than six months, we have been waiting for the trade deals to appear. Now that the dominoes appear to be lined up and ready to fall, does this mean investors are going to sell the news? Stranger things have happened in the past. The market or stock climbs a long-term wall of worry only to sell off when the critical event arrives because they think it has already been priced into the market. Sometimes they are looking forward and see no further short-term catalysts so they lock in their profits and go look for another trade. That does not work out as well when it is the market going against the grain. It is a little more difficult to take your chips off the table and go play elsewhere. What are you going to do, buy treasuries, gold, lira, soybeans? When today's news about a Mexican trade deal broke the market gapped higher but all the gains were made by 10:30. It was purely a short covering rally. 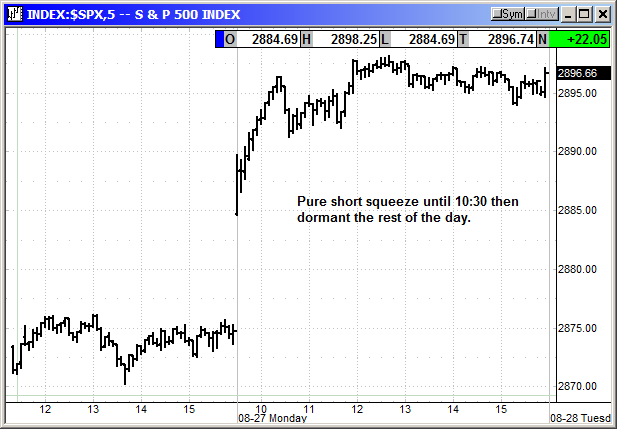 The rest of the day the market was dormant. 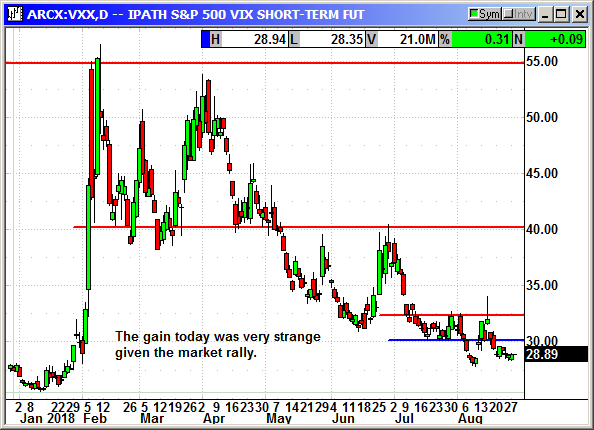 In addition, the VIX closed positive for the day when the Dow was up +259 and the S&P +22. Apparently, some traders were hedging their bets and buying puts against a potential sell the news event. The news we need to watch for is a deal with Canada. Officials are coming to Washington on Tuesday to begin negotiations. In theory a Canadian deal would be great for the market because it would take the entire "end of NAFTA" thing off the table. If the president does not renegotiate and extend NAFTA, getting the new deals through Congress could take a minimum of six months and as much as a year since that would put the vote after the mid-terms and into a dangerous setup for the president. If the Canadians agree to a deal and the president can get all sides to agree on a joint "restatement" of NAFTA then it could happen very fast. That would be positive for the market and I doubt it would produce a sell the news event because it would turn up the heat on the EU and China. If Canada refuses to negotiate, it would be market negative because that would delay the Mexican deal until 2019. Canada has a hammer in a sense but Trump also has a hammer in threatening to put tariffs on cars imported from Canada. It could be a fight. I think as long as these negotiations are in progress the market will continue to move up in fits and starts. A few points here, a few points there, with some retracement in the middle. There is never any guarantee. The positive side of the equation is the strong 24% earnings growth and the recent 4.5% Q3 GDP estimate. Those are strong supports for the market. It is not time to back up the truck and load up on longs and it is not time to move to cash. Be particular about what you buy and try to wait for the next dip. There is always a dip. 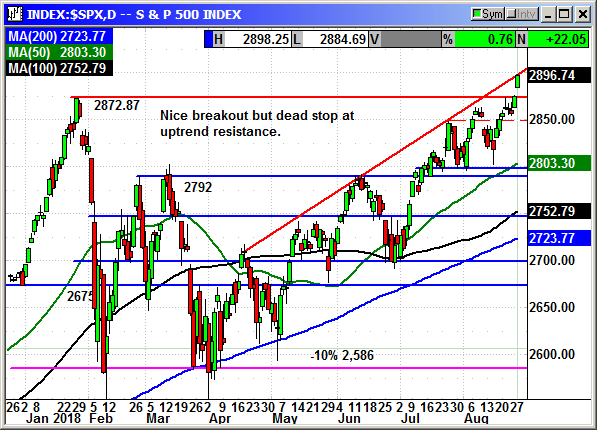 The S&P gained a very strong 22 points but came to a dead stop on uptrend resistance. This is new high and only 104 points from 3,000. That big round number target is going to be like a tractor beam and continue to lift the S&P out of every minor dip in the days ahead. The average yearend target is 2,939 with more than half of the forecasts at 3,000 or higher. These bullish analysts will continue talking the market up so that their targets have a chance of being hit. Three of the most tariff sensitive stocks finished in the top four of the Dow gainers. Those are BA, CAT, MMM. Traders who thought the trades deals would fail were heavily short and they paid the price. The Dow closed over 26,000 but still has 567 points to gain before it reaches a new high. This was a positive move but any tariff news from China can knock those three stocks back to the bottom of the losers list and take the Dow with it. Today was a step in the right direction but it is still a long road ahead. 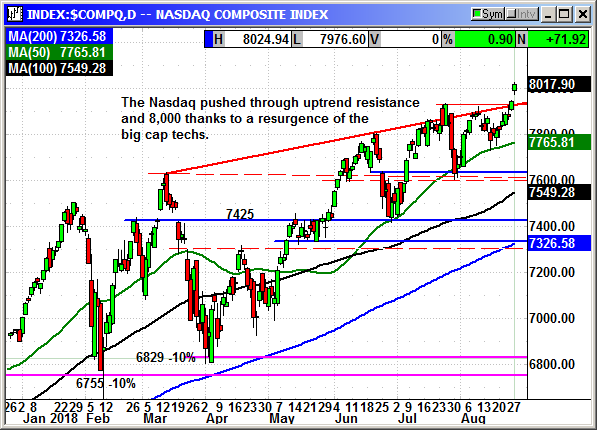 The Nasdaq Composite is clearly in breakout mode. The surge over uptrend resistance and over 8,000 for the first time was bullish. All five FAANG stocks posted big gains and TSLA was the only material loser. 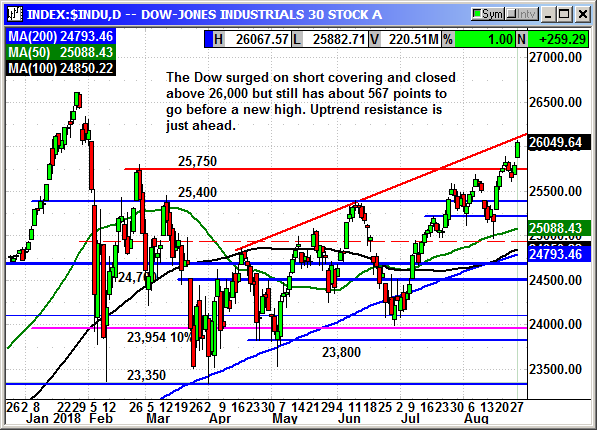 Investors are solidly back in the growth camp and the Nasdaq weakness from late July and mid August has been erased. I am not real confident the Nasdaq rally will continue at the same pace but I do expect it to continue. We are likely to see some retracement and I would buy that dip. The Russell 2000 ran into some tariff trouble. When the big cap stocks were being threatened, investors fled to small caps because they were tariff resistant. When it appeared the tariffs might be going away, investors ran back to big caps and the Russell barely closed positive. This could be a challenge for the Russell in the days ahead if the trade negotiations appear to be going smoothly. 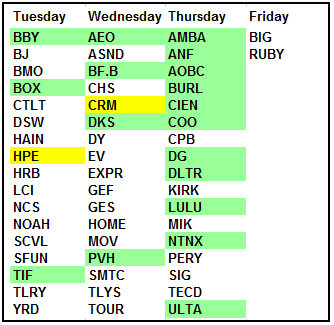 The earnings calendar has a couple large cap tech stocks in Hewlett Packard and SalesForce.com. This is mostly a retail earnings week but there is a smattering of everything. 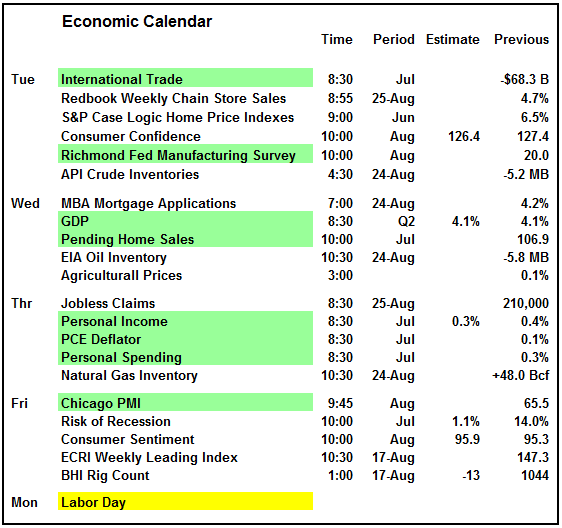 For Wednesday the Richmond Fed Survey is the most important report but it is not a market mover. The GDP revision on Wednesday is not expected to post a material change. The rest of the week will be a ghost town in the market as volume fades ahead of the holiday weekend. I would not chase the market at this point. I would look for a 1-2 day retracement and then buy the dip using tech stocks with a pulse or a decent industrial that has not run out of sight. Buying Boeing after a $25 gain over the last week is probably not a good plan. Facebook is probably a good choice because they have a lot of ground to make up from their earnings disaster. Symantec Corporation, together with its subsidiaries, provides cybersecurity solutions worldwide. It operates through two segments, Consumer Digital Safety and Enterprise Security. The Consumer Digital Safety segment provides Norton-branded services that provide multi-layer security services across desktop and mobile operating systems, public Wi-Fi connections, and home networks to defend against online threats to individuals, families, and small businesses. This segment also offers LifeLock-branded identity protection services, such as identifying and notifying users of identity-related and other events, and assisting users in remediating their impact; and digital safety platform designed to protect information across devices, customer identities, and the connected homes and families. The Enterprise Security segment provides endpoint protection products, endpoint management, messaging protection products, information protection products, cyber security services, Website security, and advanced Web and cloud security offerings. Its enterprise endpoint, network security, and management offerings supports evolving endpoints and networks, as well as provides an integrated cyber defense platform. This segment delivers its solutions through various methods, such as software, appliance, software-as-a-service, and managed services. The company serves individuals, households, and small businesses; small, medium, and large enterprises; and government and public sector customers. It markets and sells its products and related services through direct sales force, direct marketing and co-marketing programs, e-commerce and telesales platforms, distributors, Internet-based resellers, system builders, Internet service providers, employee benefits providers, wireless carriers, retailers, original equipment manufacturers, and retail and online stores. Symantec Corporation was founded in 1982 and is headquartered in Mountain View, California. Company description from FinViz.com. 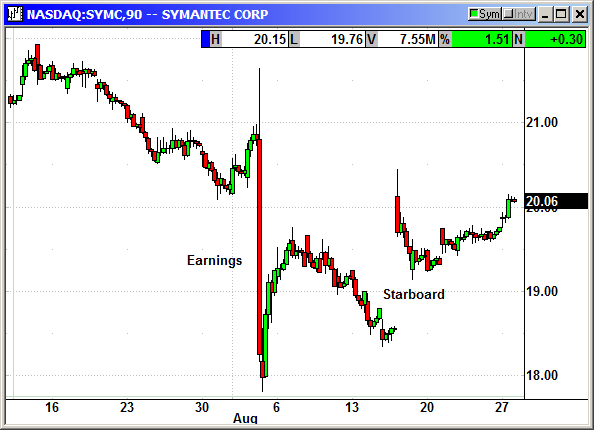 Symantec reported earnings of 34 cents and analysts expected 33 cents. Revenue fell from $1.18 billion to $1.16 billion and barely beat estimates for $1.15 billion. The company guided for Q3 earnings of 31-35 cents and analysts were expecting 37 cents. The guided for revenue of $1.13-$1.16 billion and analysts expected $1.17 billion. The CEO said large multiplatform sales are taking longer to close. Several large deals had been expected to close and it would have lifted them to solid revenue growth. Those deals are still in the pipeline. They signed one deal in Q1 with more than 100,000 users in a single company and there are more to come. Shares fell -15% on the report. After a minor rebound the shares rolled over again until Aug 16th when Starboard said they had taken a stake and nominated 5 directors. Shares rebounded back to $20 and should continue to creep higher on hopes that Starboard stirs up the board and turns the company around. Analysts believe there is 30% upside in the stock after the post earnings decline. Having Starboard in the mix could increase that gain. Shares are easing higher after making a 2-year low at $18 in early August. There is limited downside and unlimited upside. Buy Jan $21 call, currently $1.27, no initial stop loss. The short position was stopped at $21.25. The short position was stopped at $39.25. No specific news. Shares are rebounding as expected with a nice gain on Monday to a two-week high. Original Trade Description: August 13th. Akamai Technologies, Inc. provides cloud services for delivering, optimizing, and securing content and business applications over the Internet in the United States and internationally. The company offers Web and mobile performance solutions, such as Ion, a situational performance solution; Dynamic Site Accelerator that helps in consistent Website performance; Image Manager that automatically optimizes online images; CloudTest to conduct load testing and other analysis of Websites in a pre-production environment; mPulse that provides real-time Website performance data to provide insight about end-user experiences on a Website; and Global Traffic Management, a fault-tolerant solution. It also provides cloud security solutions, including Web Application Protector to safeguard Web assets from Web application and distributed denial of service; Kona Site Defender, a cloud computing security solution; Bot Manager Premier to identify bots; Fast DNS, which translates human-readable domain names into numerical IP addresses; Prolexic Routed to protect Web- and IP-based applications; and Client Reputation for protection against DDoS and Web application attacks. In addition, the company offers enterprise security solutions, including Enterprise Application Access that enables remote access to applications; and Enterprise Threat Protector to enable enterprise security teams to identify, block, and mitigate targeted threats. Further, it provides network operator solutions, including Aura Licensed CDN, Aura Managed CDN, and Intelligent DNS solutions, as well as professional services and solutions; media delivery solutions, such as adaptive delivery, download delivery, infinite media acceleration, media services, and media analytics solutions; and NetStorage, a cloud storage solution. The company sells its solutions through direct sales and service organization; and channel partners. Akamai Technologies, Inc. was founded in 1998 and is headquartered in Cambridge, Massachusetts. Company description from FinViz.com. Akamai reported earnings of 83 cents on revenue of $663 million. Analysts were expecting 80 cents on $661.9 million. The CEO was very positive on the 34% increase in earnings. He was more excited about the surging growth in their security portfolio. Akamai is getting away from simple caching and serving up websites around the world. For instance, if I had a video streaming site in Idaho that was attracting viewers in Singapore, Sydney, London, etc, I could pay Akamai a fee to maintain an exact copy of that website on multiple servers in high use areas around the world. This was originally Akamai's claim to fame. Today they are moving rapidly into cloud security. Revenue in that division rose 33% in Q2 to more than $600 million annualized. Web division revenue rose 11% to $351 million. Median and Carrier revenue rose 8% to $312 million. Platform revenue, the caching of websites, declined -14% to $44 million and almost immaterial given the total revenue of $663 million. This shows how far Akamai has come from their roots. The biggest take away from the earnings is the 33% growth in their cloud security division. This is where they are going and the business is booming with it now 25% of revenue. Their new Edge security product was recently named best in class by Forrester, Gardner and IDT. Shares collapsed post earnings despite a 30% increase in the bottom line and raised guidance for the year. The stock was caught up in the Nasdaq volatility. That appears to have faded after shares found support at $71. With the Nasdaq weak for the last two weeks, it is about time for the sector to turn positive again. 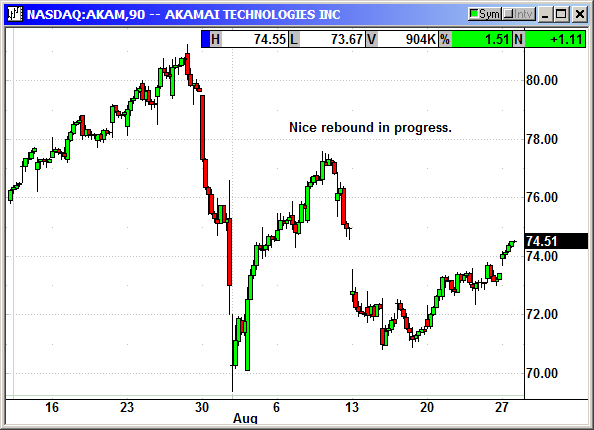 I believe Akamai will be a favorite because it has already corrected and has strong earnings and guidance. Long Nov $77.50 @ $2.68, see portfolio graphic for stop loss. No specific news. 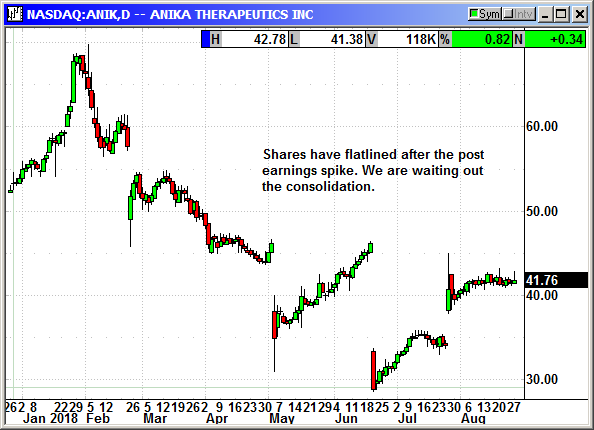 The rebound in the Nasdaq and six day spike in the chip sector lifted AMBA to hit our stop. The stock did not break resistance but it was just high enough to hit the stop loss. Earnings are Thursday so we would have had to plan an exit anyway. Original Trade Description: July 16th. Ambarella used to be the sweetheart of the semiconductor industry with their camera chips capturing a wide swath of the up and coming devices. Unfortunately, you cannot rest on past accomplishments. Shares have declined almost 40% since January. The drop began when one of their customers reported weak sales and falling demand for that company's products. When they reported Q1 earnings they beat the street but lowered guidance and that caused another move lower. Then GoPro said they would no longer sell the Karma drone, which had 12 cameras with Ambarella chips. Since GoPro accounted for roughly 20% of Ambarella's income that was a major blow. With their Q1 earnings Ambarella said GoPro income would be non-existent for the rest of the year. They said revenues would be "insignificant" in 2018 compared to $37 million in 2017. Analysts are cutting forecasts and trashing talking Ambarella's outlook. The company is also facing new competition from Qualcomm and that will increase if they eventually acquire NXP Semiconductor as expected. 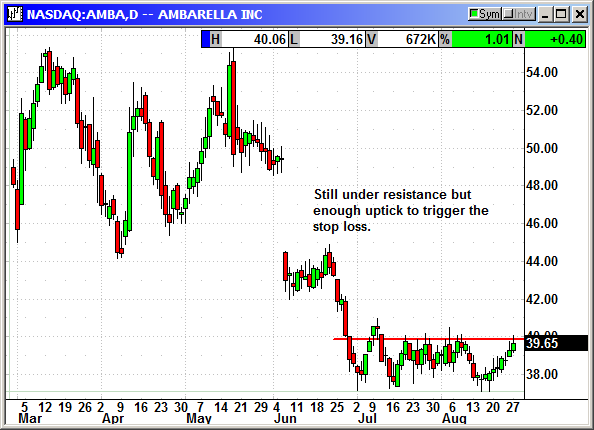 Ambarella shares closed at a two-year low on Monday and very close to a major breakdown. I am recommending we play that breakdown. Closed 8/24: Long Nov $35 put @ $2.50, exit $1.45, -1.05 loss. No specific news. Shares have flat lined after the earnings spike. 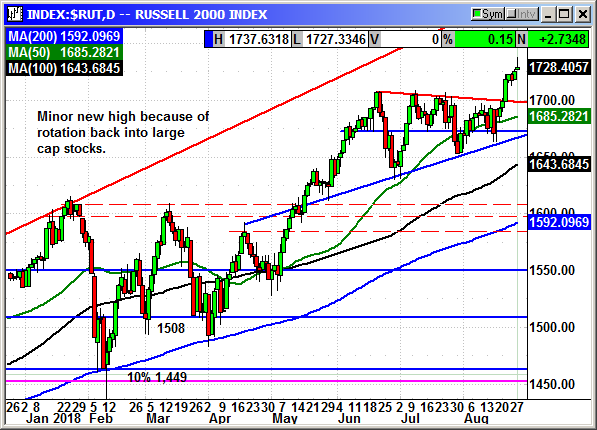 The Russell breakout did not help. I raised the stop loss on the position and we will exit on any weakness. Original Trade Description: August 6th. Anika has had several problems recently. They disappointed on earnings in early May and shares fell $11 the next morning. The stock rebounded and recovered all the loss then in mid June they reported weak results from a trial on Cingal, for osteoarthritis in the knee. The drug performed as advertised but did not generate a statistically significant reduction in pain. The trial has been extended. The drug is already approved overseas for this condition. Shares fell $18 on the news. ANIK reported earnings of 68 cents on revenue of $30.5 million. Analysts were expecting $33 cents on revenue of $27.9 million. Shares spiked on the news and I am recommending we close the August position. Anika announced an accelerated share buyback program for $30 million, 6% of the outstanding shares, to be completed in June. Shares are rebounding again. After two bouts of very sharp declines, this could be a major buying opportunity. Worst case we could see shares ease a little higher on the buyback program. Long Dec $45 call @ $2.00, see portfolio graphic for stop loss. We entered on a limit order and the option traded at 2:00 on Tuesday @ 10:00. No specific news in two weeks. Shares recovered all of their post earnings loss to close at a new high. CHGG reported earnings of 10 cents on revenue of $77 million to beat estimates of 9 cents and $74 million for the fifth consecutive earnings beat. Cash on the balance sheet reached a record high of $500 million compared to $66 million in Q2 2017. Jefferies said the cash pile offered Chegg the opportunity to expand its business outside of its own organic growth. Shares have been rising steadily since the earnings beat in February and closed at a new high on Tuesday in a very bad market. Update 7/9: Chegg acquired StudyBlue for $20.8 million in an all cash transaction. There will be no change to 2018 earnings but they will take a $1 charge in 2019 for facility consolidation. The acquisition will add a significant number of subjects to their existing offerings. The new offerings will include online flash cards. In 2016 29% of students used online flashcards. That rose to 37% in 2017 and continues to rise. Fifty percent of students claimed that was their only method of study. Update 7/30: I clearly did not have the stop loss tight enough. Shares tumbled from $29.50 to $25.50 over the last two days and did not trigger our stop loss at $25.25. Fortunately, they reported earnings after the close and shares rallied back to $27.50 in afterhours. They reported earnings of 12 cents that beat estimates for 8 cents. Revenue of $74.2 million rose 32% and beat estimates for $70.2 million. We may get lucky and have the post earnings rebound continue. I would not bet on it. However, rather than speculate tonight on an exit I would rather wait and see what happens the rest of this week. Long Oct $30 call @ $1.95, see portfolio graphic for stop loss. No specific news. Shares rebounded with the chip sector and the Nasdaq to stop us out for a minor loss. ON Semiconductor Corporation manufactures and sells semiconductor components for various electronic devices worldwide. It operates through three segments: Power Solutions Group, Analog Solutions Group, and Image Sensor Group. The Power Solutions Group segment offers discrete, module, and integrated semiconductor products for various applications, such as power switching, power conversion, signal conditioning, circuit protection, signal amplification, and voltage reference. The Analog Solutions Group segment designs and develops analog, mixed-signal, and logic application specific integrated circuits and standard products, as well as power solutions for a range of end-users in the automotive, consumer, computing, industrial, communications, medical, and aerospace/defense markets. This segment also provides trusted foundry, trusted design, and manufacturing services, as well as integrated passive devices product technology. The Image Sensor Group segment offers complementary metal oxide semiconductors and charge-coupled device image sensors, as well as proximity sensors, image signal processors, and actuator drivers for autofocus and image stabilization for a range of customers in automotive, industrial, consumer, wireless, medical, and aerospace/defense markets. The company serves original equipment manufacturers, distributors, and electronic manufacturing service providers. ON Semiconductor Corporation was founded in 1999 and is headquartered in Phoenix, Arizona. Company description from FinViz.com. ON reported Q2 earnings of 46 cents that narrowly beat estimates for 45 cents. Revenue of $1.46 billion beat estimates for $1.43 billion but that was also a narrow beat. Earnings rose 28% and revenue 9%. They guided for Q3 for revenue of $1.51 billion and analysts expected $1.48 billion. The margin guidanc eproduced implied earnings of 50 cents and analysts were expecting 48 cents. The problem with implied guidance is that it rarely works out. Mizuho said the stock continued to be a top pick. However, Morgan Stanley cut the stock to a sell with a warning the stock is facing a multiple contraction and lowered the price target to $18.50. He said shares have meaningfully outperformed since the Fairchild acquisition and the strongese analog cycle since 2010. Given the strong multiple expansion in a positive market, he could see a major reversal if the chip sector begins to weaken further. 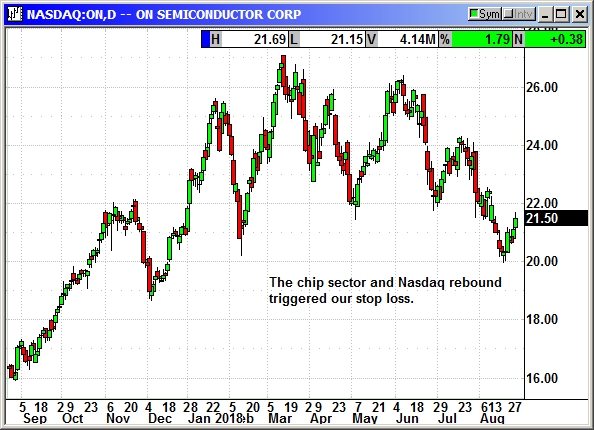 Warnings of weak demand from Microchip and a downgrade to sell on Intel is going to keep the pressure on the chip stocks. Shares closed at a 6-month low and I expect them to move lower. I am starting with a tight stop loss just in case the trend changes. Closed 8/27: Long Oct $20 put @ $.70, exit .53, -.17 loss. No specific news. 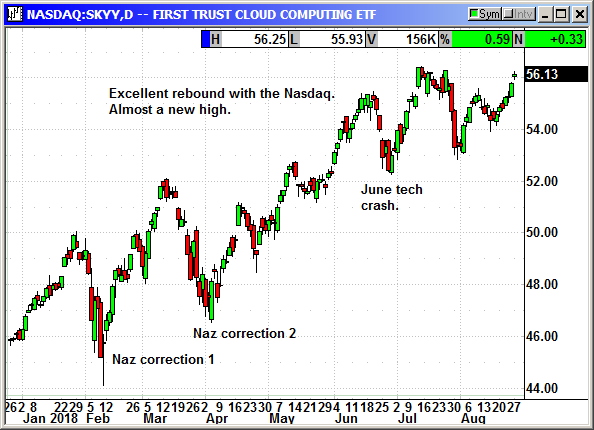 The Nasdaq rebound is lifting SKYY almost to a new high. We need it to more over $57 to inflate the option premium. Original Trade Description: July 9th. The First Trust Cloud Computing ETF is an exchange-traded fund. The investment objective of the Fund is to seek investment results that correspond generally to the price and yield, before the Fund's fees and expenses, of an equity index called the ISE Cloud Computing Index. The index is a modified equal dollar weighted index designed to track the performance of companies actively involved in the cloud computing industry. To be included in the index, a security must be engaged in a business activity supporting or utilizing the cloud computing space, listed on an index-eligible global stock exchange and have a market capitalization of at least $100 million. All securities are then classified according to the following three business segments: Pure Play Cloud Computing Companies: Companies that are direct service providers for "the cloud" (network hardware/software, storage, cloud computing services) or companies that deliver goods and services that utilize cloud computing technology. Non Pure Play Cloud Computing Companies: Companies that focus outside the cloud computing space but provide goods and services in support of the cloud computing space. Technology Conglomerate Cloud Computing Companies: Large broad-based companies that indirectly utilize or support the use of cloud computing technology. The ETF was started in 2011 and now has $1.4 billion in assets. The ETF really took off in 2016 and has been rising steadily. There have been some hiccups recently as some major companies disappointed on earnings and when the Nasdaq corrected in February and March. The ETF has caught fire in the recent tech rebound and with the Nasdaq about to break out to a new high it should continue to do well. 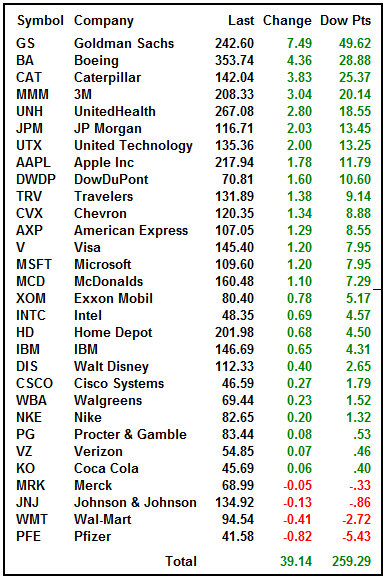 With Q2 earnings over the next six weeks, picking a tech stock gives us a limited time for appreciation and there is always the risk of a disappointment in a stock in the same sector. 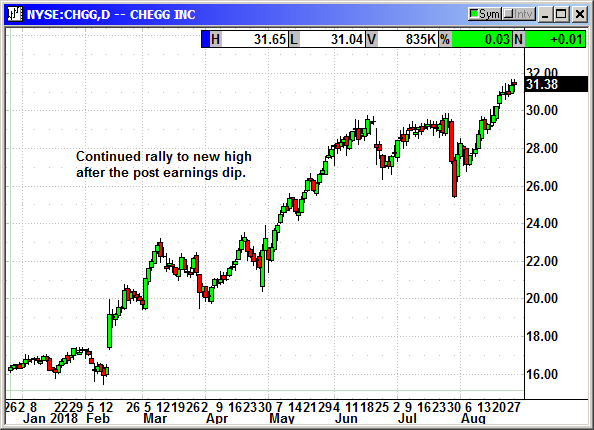 By using the ETF we can benefit from the tech rally without having too much exposure to a single stock. The idea is to profit from appreciation while reducing volatility. Shares appear poised to break out to a new high. 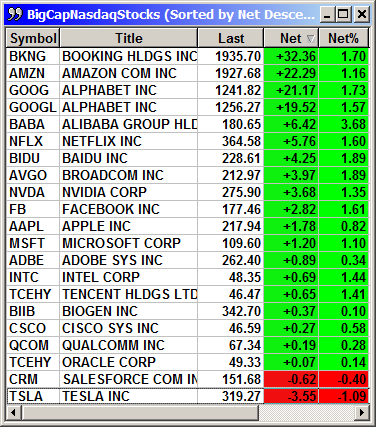 Long October $57 call at $1.25, see portfolio graphic for stop loss. Today's move was very strange. The Dow and S&P were up strongly but the VIX and VXX also posted minor gains. All of the big cap gains came at the open and the market was dormant after 10:30. Traders may have been buying some puts to hedge against the market rolling over.